: 305 р. Average online price * : 305 r.
Cream Tsinovit, not having in its composition of hormones, actively struggling with skin problems, prone to dryness, flaking, inflammation and irritation. The tool has powerful antiseptic, antibacterial and moisturizing properties. It is used in the complex for the treatment and prevention of diseases of the upper layers of the epidermis. The drug has a wide range of actions. 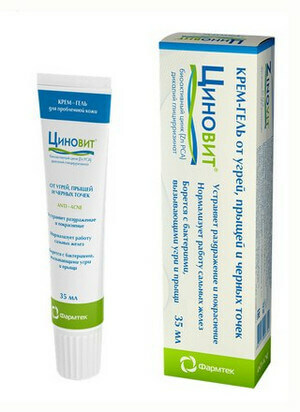 Excellent proven in the treatment of small sun or thermal burns of the skin. Doctors prefer to prescribe a cream in case of dermatitis, eczema, psoriasis, depriving. Apply the drug can be as a prophylactic agent. Begin the course should be only after full-time consultation with a dermatologist. 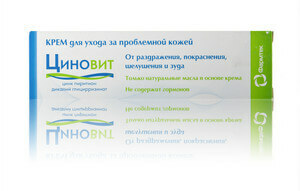 Zinovit is applied after waking up and before going to bed on the affected skin. Dosage means depends on the area of ​​damage to the skin. For a face, a dose of a pea-sized remedy is sufficient. For the body, the dose is selected individually. The tool eliminates the symptoms for 10-14 days. 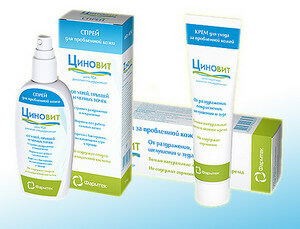 Apply Tsinovit can be an unlimited number of days, occasionally passing the examination of a dermatologist. Contraindications include hypersensitivity to any of the components of Zinovit. If during the course of treatment there is severe discomfort, intolerable burning or bright pain, it is necessary to stop using the product. Any trimester of pregnancy is a contraindication to the use of Zinovit cream. This is due to the lack of research on the effects of components on the fetus and the woman. During the breastfeeding period, there are no restrictions on the use of the drug. In some cases, allergy to the drug is possible, so it is recommended to first test for sensitivity on the elbow or behind the ear. As components of the cream used only safe substances that make it hypoallergenic. Main active ingredients: 1% zinc pyrithione and licorice root (or 1% dipotassium glycyrrhizinate). Also included in the preparation are oils of natural origin: shea, jojoba and olive. There are no dyes, proteins and fragrances in Qinovite. After application of the active component of the epidermis to the affected layer, zinc pyrithione relieves inflammation, kills pathogenic microorganisms, fights fungi. Licorice extract makes the skin less susceptible to negative factors, allergens and irritants. Oils care for the skin, give softness, fill with moisture, nourish. Keep out of the reach of children. Temperature storage mode - from 5 to 25 degrees. 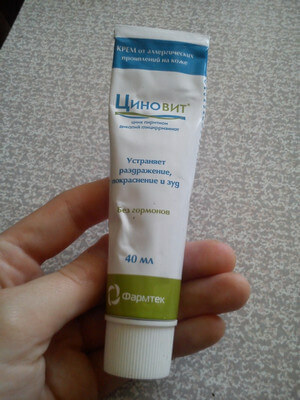 Shelf life of a closed tube is 3 years from the date of issue, open - 1 year.